During our 14 years of RV travel — eight of which have been full-time — Pam and I have witnessed a few RV fails and managed a few of our own, too! From those past experiences, I would like to share 13 ways you can screw up your RV. Hopefully, you may find these useful in your RV travels. Early on, we learned this lesson the hard way. We were using an EMS with our RV, a $350 unit, which protected our RV from electrical issues. But when we plugged into one RV park pedestal, it blew up the unit. We had to send it back to the manufacturer to get it fixed. What if we had plugged in the RV power cord instead? 240 volts of electricity would have been sent through the 120-volt electrical system and ruined every electrical appliance in the RV. 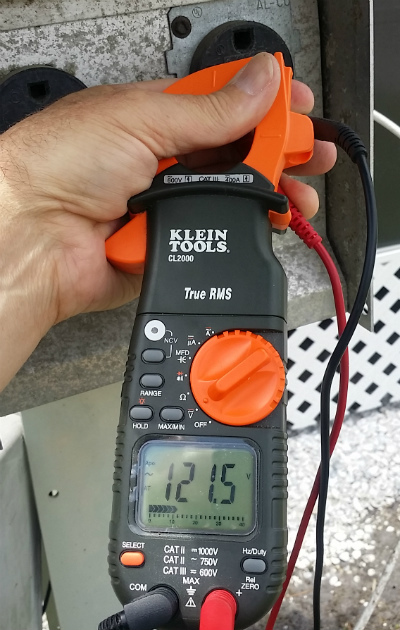 The easy solution is to carry a volt meter and check that the RV electrical pedestal is wired properly. You need to verify there are no reverse polarity issues, there is a proper ground, and the proper voltage is being delivered to your RV. I now do this every time I plug into an RV park's service. There are times when I have to contact the RV park office and request a member of maintenance to assist us before accepting 120-volt service from the RV park. 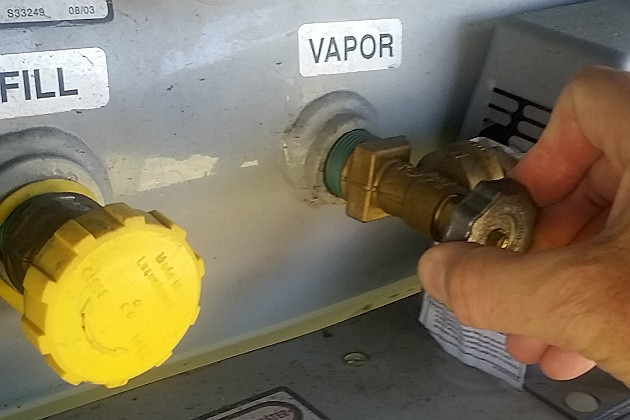 Most RVers travel with the propane system energized during travel to keep the RV refrigerator working. These units will work on either electric or propane. Using the propane system while traveling seems to make sense — no generator required. However, what if during travel the propane system is damaged due to road debris or another failure? That could expel high-pressure propane gas into areas that could erupt in flames due to hot components or sparks during highway travel. 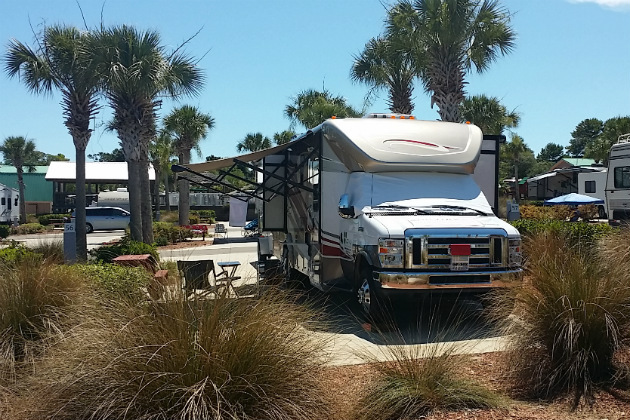 Most RV manufacturers recommend turning off the propane during travel. We learned this one the hard way with a small RV fire early on in our full-time RV living. We traveled with the propane system energized because when we rented RVs, that is what they recommended we do. But then we learned the truth, so please don't travel with the propane system turned on. One of the worst things you can do is to travel in your RV while it is an overloaded condition. Overloading puts excess stress on the RV suspension and the vehicle's tires. If the weight that is applied to these systems is more than they are designed to handle, it could lead to disastrous results during travel. You do not want to have a tire blowout while traveling at highway speeds. The best way to avoid this situation is to know the load-carrying capacity of your RV. You can acquire this information from the RV's data plate. Any RV that was manufactured after the year 2000 now has a yellow label that will state the RV's cargo carrying capacity. You can estimate the amount of cargo you place in your RV given the cargo carrying capacity rating. But the best way to know if you are overloaded is to weigh your RV when it is loaded for travel with all your personal items aboard, the RV fuel tank full and the amount of fresh water you plan on traveling with. There are organizations like the RV Safety and Education Foundation that set up weigh stations at RV shows and rallies. You can make an appointment to have your RV weighed at each tire. If the RV is a towable unit, the tow vehicle will be considered as well. Once your RV is weighed at each tire, only then can you know if you are overloaded based on the maximum load the axles and tires can carry. Most people don’t even think about this one, but once you understand how an RV absorption refrigerator works it makes complete sense. It is also a huge safety issue. 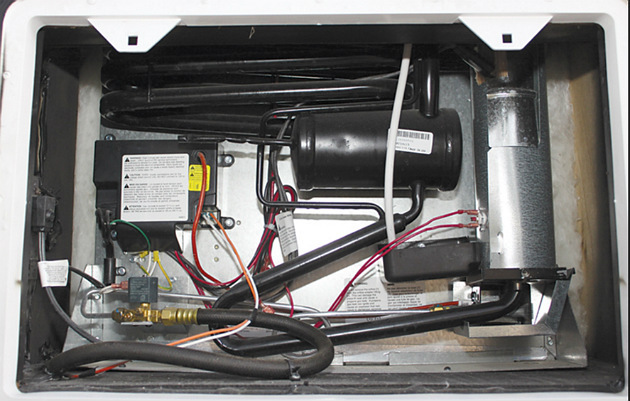 If the RV is not level during the cooling cycle, the cooling unit can overheat and cause a fire. 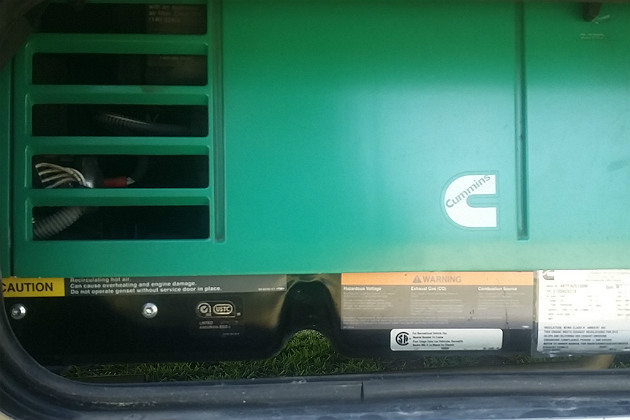 If you look at the slight angle of the cooling unit tubes shown in the photo to the right, you can see that if an RV is in an unlevel condition during operation, the flow of liquids and gasses will not be able to complete the cooling cycle correctly. If this happens, the system will have to work harder to complete the cooling cycle. The unit runs hotter to compensate for this unlevel condition. Operating the refrigerator for an extended period like this can ruin the cooling unit — and these are expensive. Also, it can run so hot that it can destroy the cooling unit. If the emergency cut-off switch does not do its job, the unit could catch fire. If you heed my earlier warning to not travel with the propane system on during travel, you will never have to worry about this situation. When parked for camping you should assure a level condition for the RV and therefore safe and effective cooling for your RV refrigerator. If every 120-volt appliance is off in the RV, this is not such a big deal. But that is usually not the case. Plugging and unplugging from the electrical pedestal with electrical load can create an arcing condition. This condition could damage whatever was turned on inside the RV. Over time, continued repetition of this can lead to plug damage. Plugging and unplugging the power cord with the power on is not like turning the power on and off by the electrical breaker. It is a more abrupt and possibly destructive way to deliver and remove electrical service from an RV. The simplest thing to do is to be sure to turn the electrical pedestal's breaker off before plugging in and unplugging from the 30 or 50 amp power source. 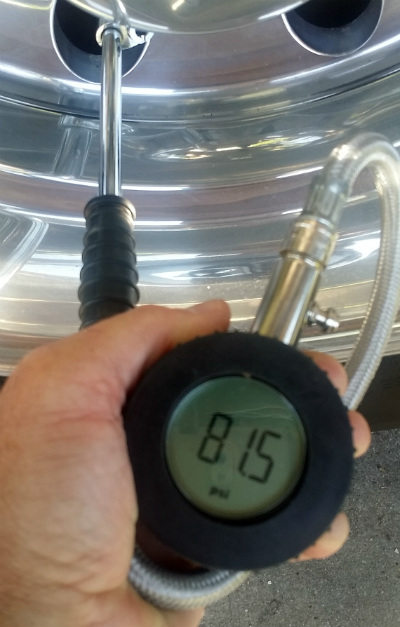 One of the quickest and safest things you can do for your RV before you travel is to check your tires cold pressure. This does not take long, and it can save you from a highway mishap. Your tires are supporting the entire weight of your RV. If there is too much or two little air in the tires, that will affect their function. Tires that are not inflated to the correct levels can suffer from damage to the structure of the tire and lead to a tire failure. RV tires have a cold pressure value located on the sidewall of the tire that show its maximum inflation pressure. In other words, the pressure of the tire when it has not been driven on, and that has not been sitting out in the sunlight. A hot tire can read five to 15 psi higher than a cold tire. Checking inflation pressure when a tire is warm will lead to underinflated tires. If you are unsure what the correct pressure is for your tires, refer to the data plate either inside or outside the RV. It will list both axle loads and suggested tire pressure settings. Using a good truck-style pressure gauge, set each tire accordingly. If you have trouble reaching the valve stems of your tires, consider adding valve stem extensions, so this will be an easy thing to do each time you hit the road. 7. Don't back into an RV site you have not first looked at! Now this is just my opinion, but it can save you a lot of headaches if you take the time to see where you are going to park before pulling up to an RV site with your RV. Sometimes, a preparking check of your RV site could save you from having to move to another site because the one you were given just did not work. Why is this so important? What if the location of the park's utility services are too far away for your RV to reach them? What if your electrical cord is not long enough to reach the electrical pedestal? What if you don't have enough sewer hose to reach the sewer inlet? How about reaching the water service? What if there are tree issues and slide-out issues? It is better to resolve all these things before you go through all the effort of parking your RV. Just ask at the RV park office if you can check things out before hand. Your RV batteries will most likely require that distilled water be occasionally added. This is necessary for them to function properly. If this simple maintenance item is ignored, it could be costly. A good deep-cycle RV battery used for the 12-volt DC house system can cost $100 or more. For larger RVs that have four or more of these, you don't want to miss out on extending their life by simply checking the batteries' water level regularly. For those who use their RVs regularly, it is best to set up a schedule to check water levels in every battery at the start of the month. That way you will never be left with batteries that ruin your RV adventures because they are not able to hold a charge. One of the poorest sources of electrical power for your RV can come from RV parks. 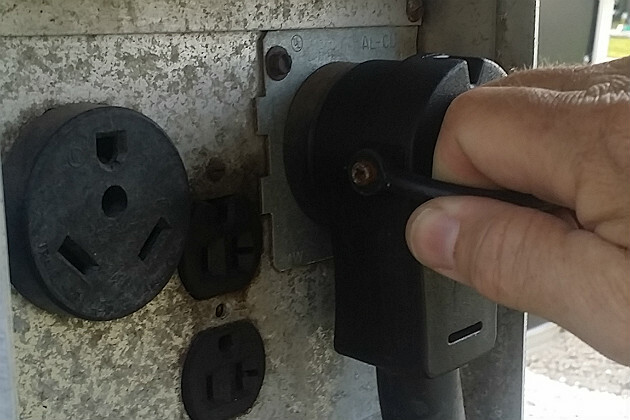 It is possible to plug into an RV park pedestal and ruin all the appliances and electronics inside your RV. Why does this happen? It can be from an improperly wired electrical pedestal or an electrical surge or short. The only simple way to avoid this problem is to use an electrical management system. They are designed to plug into the RV park electrical pedestal. The RV is then plugged into the EMS. These devices check for high and low voltage, frequency, grounding and polarity. Some even offer more diagnostic functions. But what is most important is that if the power coming in is corrupted, the device will not allow voltage to flow to the RV, thereby saving you from a costly repair. If there is a sudden surge that could destroy your electronics and appliances, the EMS will take stop the excess voltage from entering your RV. 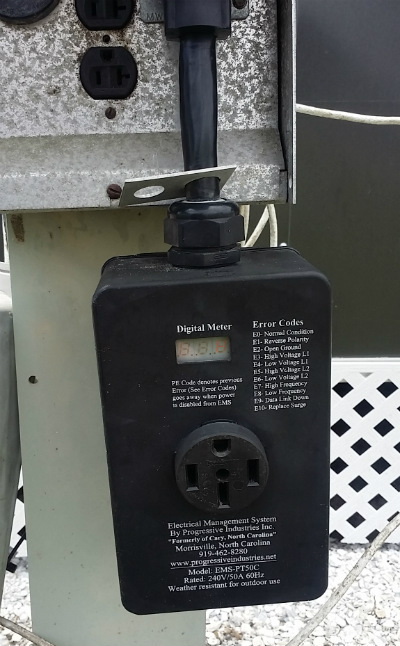 And of course, as I mentioned earlier, it is always a good idea to take a voltage meter and double check that the electrical pedestal appears to be wired correctly. Don’t leave your RV plugged in without one of these attached to your power cord. In addition to verifying proper tire inflation, knowing the age of your tires is extremely important for your safety and that of your RV. The National Transportation and Safety Board came out with a statement recently stating tires that are 6 years old or older should be replaced. It does not matter how much tread they have left or how well they have been maintained. At that age, the rubber and the compounds that protect the tire are no longer able to do their job. 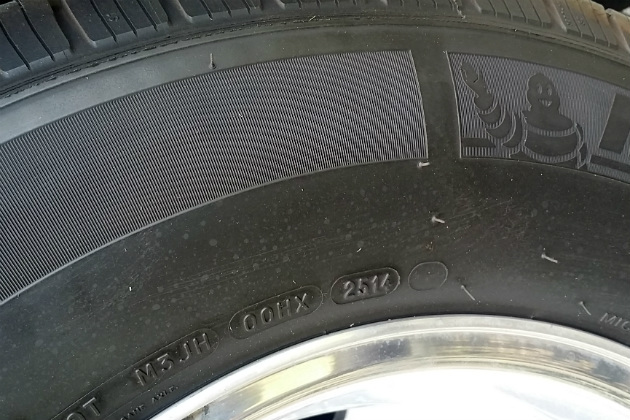 You can verify your RV tire's age by looking for the DOT code located on the sidewall of the tire. It may be facing out so you can see it or it may be located on the inside tire wall. It is only stamped on one side. For tires manufactured after the year 2000, you are looking for a four digit code. The first two digits denote the week the tire was made and the second two digits are the year of manufacture. So, looking at the picture here, the tire shown was manufactured in the 25th week of the year 2014. Most serious maintenance problems that arise in RVs a few years down the road come from issues on the roof. When sealant degrades and cracks due to flexing and UV damage, the possibility of water damage increases. Over time, these issues can lead to structural weaknesses and possible failure — especially around slide-outs. If you use your RV for full-time living, it is best to check the roof of your RV on a monthly basis. Add it to your first-of-the-month regular maintenance items. 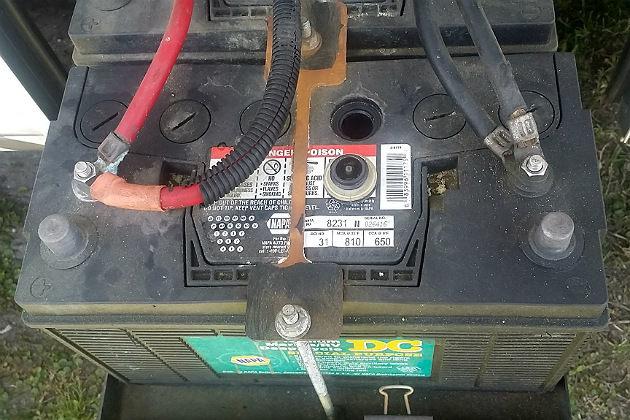 While you are checking those batteries, take a quick look at the roof and examine all sealant joints around roof penetrations, at the front and rear cap joints, and along the rail trim of both sides of the RV. Once water penetrates the internal structure of the RV, it is difficult to reverse the damage. Mold will quickly develop, and the odors that come from that are extremely hard to remove, not to mention that is not the kind of environment you want to live in. 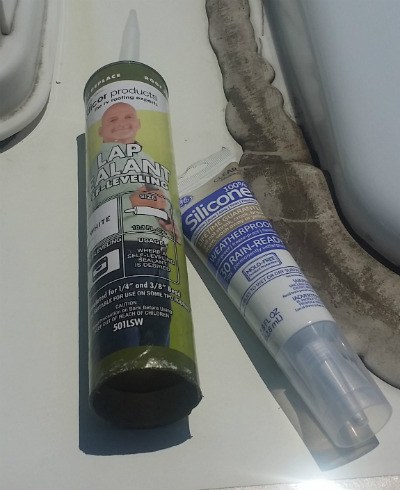 So, you were up on the roof of your RV, and you found areas where the sealant has failed. How can you fix it? First off, don't take shortcuts or you will be fixing it a short time later. The best way to find out what type of sealant you should be using is to refer to the RV manufacturer's documentation. They should have outlined what maintenance items are recommended and the types of sealants that were applied to your RV. Having that information you can buy those products and repair the damage properly. 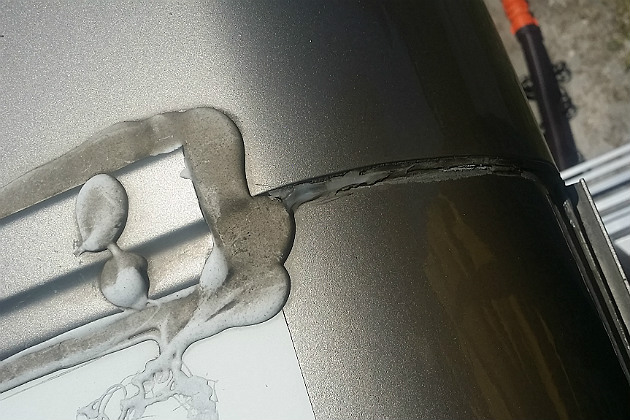 That being said, don't apply sealant over existing sealant unless the product manufacturer outlines how to do that properly. For example, silicon sealant is easy to use and make repairs with, however, silicon sealant will not stick to itself long term. New silicon applied over the old sealant will peel off within a short period. It is always better to remove the failing sealant and repair the roof joint with a fresh layer of sealant. Follow this recommendation, and you will save yourself from a lot of work and expense later on! Many people think that by using their RV's generator, they are going to wear it out. They also think that when it comes to trading in the RV, low generator hours adds value. Guess what: It does not make a difference. RV generators are one of those items that unless you run it on a regular basis, you are doing damage to it. Regularly exercising your RV generator is the only way to keep it running efficiently.Not running it on a regular basis can cause moisture to build up in the fuel system, thereby causing poor performance. In a 30-day period, the fuel in a gas-powered generator can begin to gum and varnish the fuel system. This can cause the generator to be hard to start and not able to run at a stable speed. Onan recommends their gasoline generators be run at a minimum of 50 percent load for two hours every four weeks. So, if you have a 4,000-watt generator, running the AC unit would suffice to meet this criterion. This action is necessary to keep moving parts lubricated and to rid the fuel system of moisture. The two-hour run time is recommended over several shorter run cycles. This is an easy thing to do while traveling with your RV. During travel, fire up the generator, and if you are traveling in the warmer months, fire up the AC unit. Just be sure to apply a 50 percent load on your generator based on its output wattage. If you have a diesel generator, the same principle applies. Regularly running it will reduce internal moisture and help to keep all the seals lubricated. If you are unable to regularly exercise your RV's generator, you can add a fuel stabilizer to the diesel or gas system and run the generator under load as recommended before. This will help to treat the entire fuel system and prepare it for longer-term storage. However, the best maintenance for an RV generator is to simply run it.